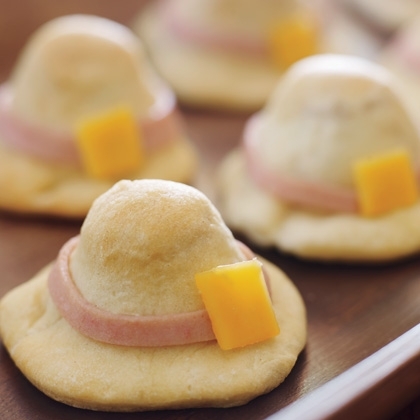 This cute pigs in a Pilgrim hat recipe is a variation on the old “pigs in a blanket” appetizer, except in this case the pigs are all dressed up for Thanksgiving. One of the best parts for me about the holidays is having some fun with food. These little pilgrim hats have a spicy surprise in the center, but the hat looks as though it could have been a part of the first Thanksgiving day! And if you are looking for something to start at breakfast, check out these recipes for National Cinnamon Crescent Day. The spicy appetizers would make a great start to your Thanksgiving gathering and will surely put guests in a thankful mood! The idea for this adorable little food project came from Family Fun Magazine which no longer has a print edition. The recipe is fun and easy to do. The original recipe that I found used bologna and hot dogs. I adapted it more for adult tastes by using Italian sausages and ham. The Italian sausages are first cut into 1 inch pieces and placed fairly wide apart on a cookie sheet. This gives a rounded area for the dough to sit on to make it look hat shaped. Normal crescent roll dough is used for the hat. Separate the dough along the perforation lines and drape the dough over the sausage pieces being sure to leave plenty of extra dough around the outside edges. Dip a glass into some flour and then place it over the sausage area for the brim. Add some flour to your hands and press the dough close to the sausage for the dome of the hat with the brim sticking out. These little hats will go into the oven for 10 – 12 minutes to cook. Cut the ham into thin strips and the cheddar cheese into small squares. Arrange the ham around the cooled hats just at the brim line and position the square of cheese on the brim making a buckle like shape. The Pigs in a Pilgrim hat have a nice crisp outside area with a spicy center that the grown ups will like. To make a batch for the kids, just use hot dogs instead of the sausage if your child doesn’t like spicy food. Get creative and you will have something a bit different to offer as a Thanksgiving appetizer. These little pilgrim hats have a spicy surprise in the center, but the hat looks as though it could have been a part of the first Thanksgiving day! Pre-Heat the oven to 350° F. Cut the Italian sausages into eight 1-inch segments. Separate the crescent dough along the perforations. On a cookie sheet covered with parchment paper, stand the pieces of Italian sausages on their ends, being sure to space them well apart. Drape a triangle of dough over a segment of sausage. 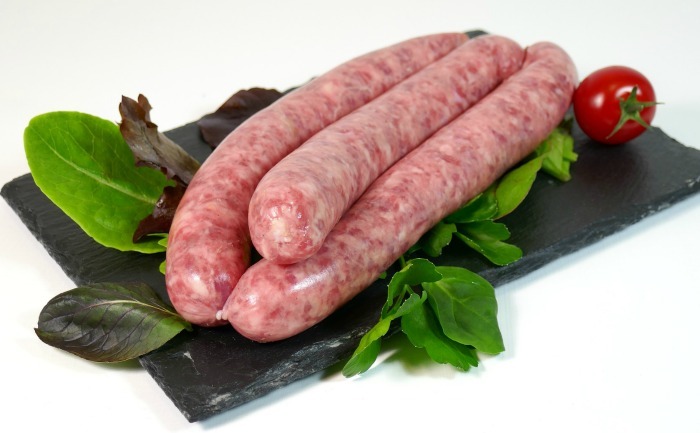 Dip a glass in flour, then use it to cut out a circle centered on the sausage segment. With floured hands, press the dough around the segment to form a hat shape. Repeat to make the remaining hats. Bake them for 10 to 12 minutes. While they are cooking, cut eight thin strips of ham and eight small squares of cheddar cheese. Arrange them on the cooled hats with the ham making the rim and the cheese a buckle.